Dreams like to toy with our perceptions of things, often skewing our view of life, or even turning it up upside down. They have a reason for that; they want you to remember them. The biggest obstacle getting in the way benefiting from of a dream's message is that dreams are so easily forgotten as we wake up in the morning. One of the most common complaints I hear in dream classes goes something like this: "I was just in that twilight zone between sleep and being awake, and I remembered my dream vividly. I had every detail. I even saw it in color. I could hear the sounds, smell the smells, and I was positive I would remember the whole experience. Then I rolled over in bed and my mind drifted. I doubt if it was even 30 seconds later when I put my attention back on the dream. But now, I could not remember any of it. It was gone, and no amount of pondering or trying to recall it would bring it back. I was really frustrated, because I was sure it was a fascinating dream. That much, at least, I remembered." This is an experience almost all of us can relate to. And it can be aggravating. But not to worry! If the dream message is particularly important, it will be back, often with a vengeance. If the dream has been lost, the subconscious will try again, this time, using more extreme imagery because it knows that, if it startles the dreamer--or downright scares him/her--the dream will be remembered. What follows is a case in point. The dreamer is a woman in her mid 30s. My dream is pretty short, but I woke up from it in a sweat; it really upset me. In my dream, I was in my kitchen, cooking supper for my family. My kitchen has a window by the sink and it also has a sliding glass door out onto a deck. Anyway, I looked up from the sink and there was a clown staring in at me, making faces. It startled me at first, but I started to laugh. 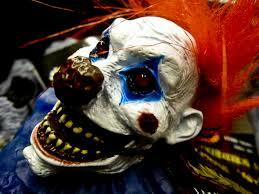 But then, the clown got more sinister. The face got uglier and more menacing. Then, there were two clowns in the window. And then I looked over at the door, and there was a clown there, too. Suddenly, there were clowns all over the deck and they were covering the window with their scary faces. I could tell that they wanted to get into the house, and I was really frightened. I started screaming at them to go away, but they ignored me. I guess I must have actually been yelling in my sleep, because that's when I woke up. I was panting in fear, and I was covered with sweat. Interesting dream! We'll start working on it on Wednesday.